Renderings by Studio One Eleven. Rendering of the added seating included in the Social List bulb-out. A much needed crosswalk will be added to 4th Street’s Retro Row corridor thanks to a public-private partnership between the owners of The Social List and Lola’s Mexican Cuisine and the City of Long Beach. Three years ago, the original plan was to build a parklet in front of The Social List, although the discovery of a vault located underneath the proposed site during the summer power outages of 2015, when Southern California Edison came out to ensure an underground explosion wouldn’t happen near the restaurant, altered those designs. With the idea to further activate the block with an additional parklet out of the question, Senior Principal of local architecture firm Studio One Eleven, Michael Bohn, proposed the idea for a bulb-out instead. The Navarro family, which owns The Social List, then negotiated a deal with Councilwoman Jeannine Pearce, where they would privately finance the bulb-out with their landlord, Curtis Harris, and Pearce would help them add a much needed crosswalk to 4th Street at St. Louis Avenue next to the restaurant. 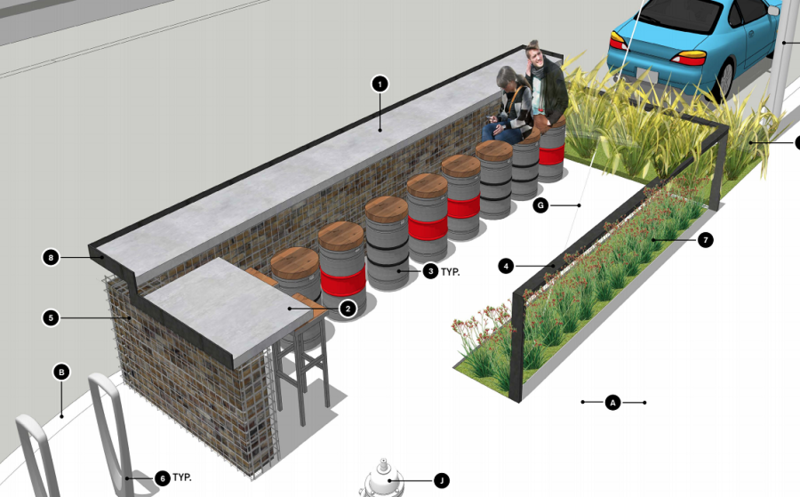 In partnership with Studio One Eleven, the bulb-out is designed to offer Social List guests more patio seating, add greenery to the corridor and improve pedestrian safety in the area. 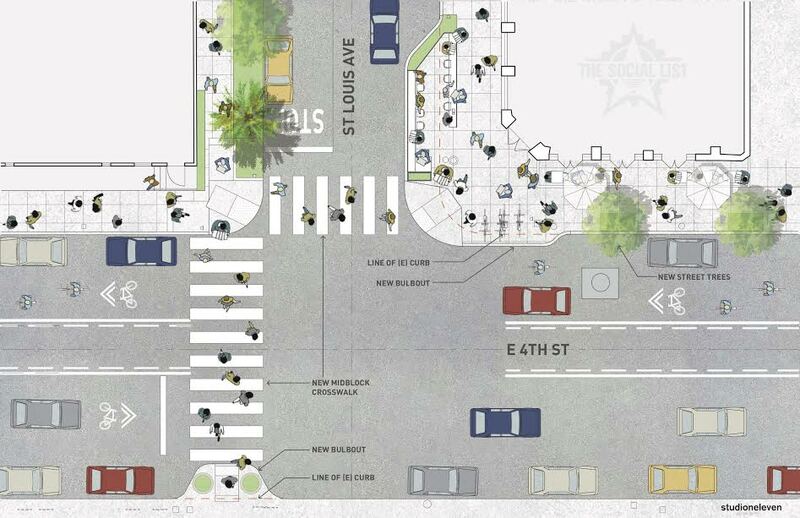 Rendering of the crosswalk and bulb-out project at 4th Street and St. Louis Avenue. Falling under both public safety and beatification initiatives, the bulb-out will slow traffic by narrowing the road as well as shorten the distance pedestrians must walk to cross it. With the addition of the crosswalk, no longer will Retro Row patrons have to jaywalk across the street, or walk the oftentimes annoying distance to one of two intersections to cross safely and legally at Junipero and Cherry avenues. Pearce has dedicated $13,000 to the crosswalk, the Navarros and Harris have contributed $36,000 to the bulb-out and Public Works has dedicated $25,000 to the project and to the Rapid Flashing Beacons to be added to the crosswalk. The bulb-out and crosswalk are expected to be completed by the end of February. Navarro added that the parklet at Lola’s Mexican Cuisine—the first ever parklet in Long Beach— will also be receiving a makeover to be finished a few weeks following the completion of the bulb-out and crosswalk project. In more 4th Street corridor news, Pearce announced today that the proposal to add a traffic signal to 4th Street and Obispo Avenue will be brought to Long Beach City Council on March 6. Pearce also included that Festoon Lights will be added to the southern side of the Retro Row corridor, in an effort to improve safety, beautify the street and spur nighttime business. She is encouraging retail businesses to stay open later to rival the area’s restaurant culture, and has put forth $40,000 of funding from her office toward “Retro Row 2.0”, according to the release from her office.